Eevee is hugely responsible for the success of certain Eeveelutions that would otherwise be slow without it. Most GX versions of Eeveelutions has at least a good to great single energy attacks and/or abilities that would want to be online ASAP. 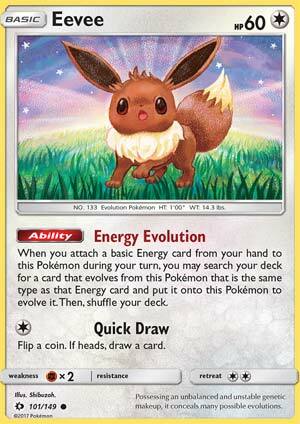 However, there are some Eeveelutions that cannot make use of Energy Evolution; Flareon Plasma needs DCE for its Vengeance attack and has no room for Basic Fire energies; Triple Effect Eeveelutions from XY Ancient Origins would not benefit from Energy Evolutions since adding three basic energy cards will ruin consistency. Even so, you are obligated not to use that ability. Expanded has another Eevee (XY Furious Fists 80/111) with the same ability, but with 50 HP, a retreat cost of one, and an attack that does 10 damage for 2 Energy (ouch!). It’s up to you to decide if the retreat cost is a big deal or not. Of course, you’ve got to deal with ability denial because that shuts off Energy Evolution. Devolution is still a thing, so if Espeon-EX or Shining Jirachi removes your highest stage Evolution, and if certain damage is already there, it might be enough to KO your Eevee if it already has 60 damage on it. 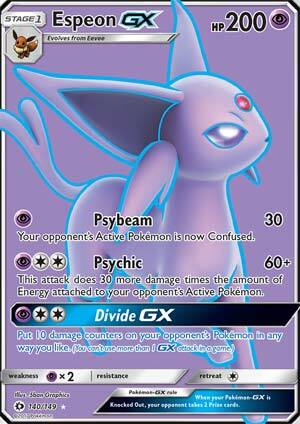 In Limited, this card appears in the Sun & Moon Base Set, and both Espeon-GX and Umbreon-GX are in this set as well. If you pulled any of those plus this one, then it’s a must run. Some of their attacks are DCE compatible, and DCE is also in this set.